Here’s a script written in response to a newsgroup post today on microsoft.public.exchange.admin. Exchange Server allows you to automatically forward inbound mail for one recipient to another recipient. You can forward messages to the alternate recipient, without delivering a copy to the original recipient (effectively redirecting inbound mail for the recipient), or deliver messages to both original and alternate recipients. In Exchange 2013 and Exchange Online, you can find Delivery Options under Mailbox Features > Mail Flow. Users can also configure automatic email forwarding using OWA. 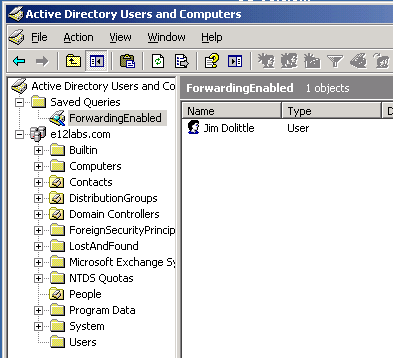 In Exchange 2010 and Exchange 2007, Delivery Options is found in the Mail Flow Settings tab in a recipient’s properties in EMC. In Exchange 2003, Delivery Options is on the Exchange General tab in ADUC. 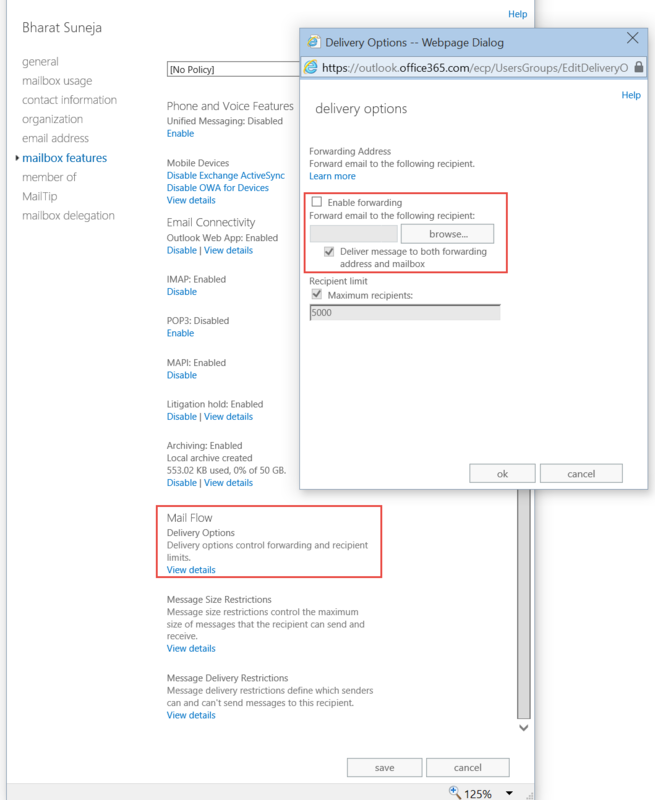 To forward to an external email address, create a (mail-enabled) Contact in AD, which is no longer required in Exchange 2013/Exchange Online – you can type an SMTP address in the field. Requirement: List users with email forwarding enabled. The other half of the requirement is to actually list the name of the user/mailbox being forwarded to. This is something ADUC can’t do – there’s no choice to add and display the altRecipient in a column next to each user. The script will show all mailboxes setup to forward to an alternate recipient, the recipient being forwarded to (altRecipient), and also if messages are being delivered to both — the original recipient’s mailbox and the alternate recipient. – 3/3/2015: Added Exchange 2013 and Exchange Online/Office 365 screenshot and info. 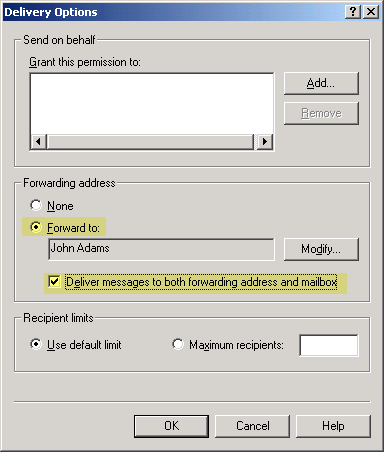 – 2/1/2009: Added command to output primary SMTP address of recipient being forwarded to. Bharat, any chance you could help me out and mod this script a little. I ran it as is and there were over 200 users listed. This of course ran off the screen, and this is a report that I need to get across several of my email environments. We are in the process of collapsing email environments, to go form 12 to 1. Having the output sent to file would be brilliant. Output to a text file from any script is quite easily accomplished from the command line. appends to an existing file. I normally include a /f: switch with scripts to output to a file, but forgot to do that in this script. Will add this soon! I used this code to add to my “Saved Queries” and it worked perfectly. Thanks. I’m also looking for a reporting method to show mailbox usage for my Exchange 2000 server. Do you have any suggestions on reporting on this info? I used this code in my “Saved Queries” and it worked perfectly. I am looking for a way to report on my Exchange 2000 users mailboxes to report on mailbox usage. (Whether or not they are actually being used by the Owner) Do you have any suggestions? I used your code in my “saved queries” and it worked perfectly. I am looking for a method to report on my Exchange 2000 mailboxes to see if they are actually being used by the mailbox owner. Do you have any suggestions on how to do this? @dafa: Thanks for pointing out – corrected. i know.. very old post. hopefully the author takes a peek. This command works great but is it possible to get the actual email address that it forwards to instead of just the contact object? @Charles: Post updated with additional command to spit out SMTP address of the ForwardingAddress recipient. 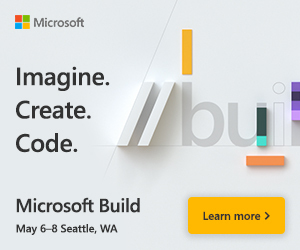 Please see the last code snipped in this post – it lists the mailbox and the SMTP address to which messages are forwarded. I’m getting a null error (line 48, character 13) when running the script – am new to vbs scripts so can you help me troubleshoot please? Hi Bharat, how can I redirect the output to a txt file? Typing the whole canonical name out works fine (altrecipient=CN=Smith\, John,OU=Users,DC=acme,DC=com), and so does replacing the search with a plain * it's just using a partial string wildcard that refuses to work. Link to the Zip file seems to be broken…. Pipeline not executed because a pipeline is already executing. Pipelines cannot be executed concurrently. Hope this thread still alive. Great script, helped me a lot. Only thing thou, when I try to output it to a txt file (script.vbs>file.txt), I get an empty file, 0KB. Exchange Server allows you to forward inbound mail for one recipient to another recipient. The script seems really effective. This command works correctly and with great convenience. Any chance that this can output into a CSV file? Please and thank you. anyone can help me for pipeline error ?